Last call for my workshop this Tuesday! “The Historic Craft of Letterpress Printing” Tuesday, November 29th from 6 to 8 at A. J. Smith Elementary School in Union Springs, New York. 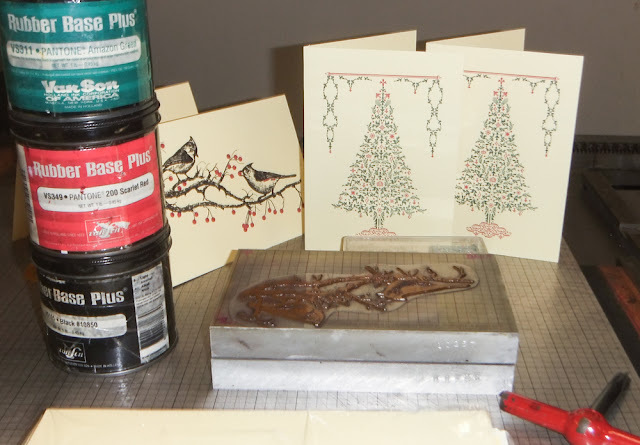 In this one evening workshop you will choose from two seasonal card designs to print on real antique presses. At the end of the workshop you will have 12 beautiful letterpress printed cards to take home and use! Materials Fee of $10 payable to the instructor will be collected during the class. All materials will be provided. Registration fee is $15.